Just as summer winds down, Southside Gallery is exhibiting the intricate beauty of nature. 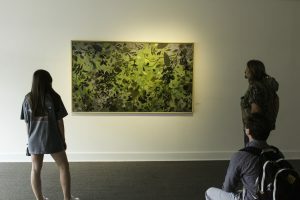 “Green,” Oxford artist Carlyle Wolfe’s seventh exhibition at Southside, is on display until Sunday. The artist’s reception is from 5 p.m. to 8 p.m. Thursday. Wolfe has always been inspired by the natural world. Over the past 15 years, she has been making line drawings of plants and using the cutout silhouettes as stencils for paintings. Wolfe said she has always been drawn to the details of the natural world because the more closely one examines nature, the more one sees. Wolfe said that over the years her vision has become more sensitive and she understands plants better. Each painting focuses on a specific moment in time when Wolfe experienced a color group and lighting environment that was particularly influential to her. In addition to paper, in the past year, Wolfe has also begun working with stainless steel to create stencils. “Stainless steel is a lot like the cut paper because it gives me that plainer shape, and the cut-out is so much more durable, so it gives me a lot more different options,” Wolfe said. “Green” also features “shadow paintings” in which Wolfe paints traced shadows cast from natural light. Her “shadow painting” concept originated when she was in graduate school at Louisiana State University. Wolfe said she loves to put her panel on an easel and search for intricate, hidden shadows that may not be as obvious. Wil Cook has been the director of Southside for the past 13 years and thinks this is Wolfe’s most impressive exhibit yet.